1. The first railway connection was established between Moscow and St Petersburg, and for the first three days of opening passengers could use it free of charge. Why? Because not many people felt adventurous enough to try this new mysterious and unexplored means of transport. 2. The middle of the Trans-Siberian railway is a station called Половина (Polovina) meaning “Middle”. It is the same distance from both Moscow and Vladivostok. 3. It takes 8 days, 4 hours, and 25 minutes to travel all the way from Moscow to Vladivostok. Prepare for some dedicated sitting. 4. 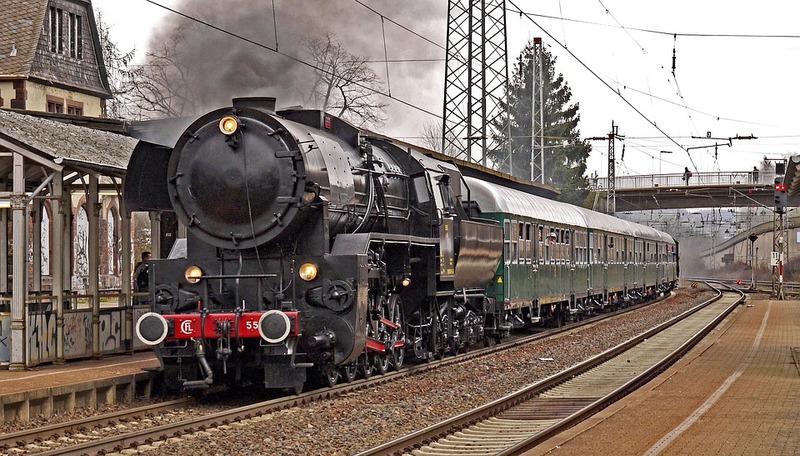 First passenger trains in the 19th century were as fast as 33 km per hour, while modern trains can go up to 580 km per hour. 5. In 2015 Russia launched the first double-decker train to create space for more people and make the tickets cheaper. 6. The Trans-Siberian covers a staggering eight different time-zones. However, all timetables and station clocks are in Moscow time. Good luck with not missing your train. 7. If we join up all of the rail belonging to Russian Railways end to end it would be enough to cover the equator twice! 8. Russian trains use broad gauge railways while China uses standard gauge. To help trains cross the border, each of the carriages has to be lifted up to have its bogies changed. 9. Statistically, travelling by train is 45 times safer than by a car. Not to mention environmentally friendly. 10. The part between the stations Mogocha and Skovorodino is the coldest part of the Trans-Siberian railway. The temperature here may be as low as -62 degrees. If any of these facts peaked your interest, IntoRussia is happy to introduce the first UK platform that allows you to instantly and independently book and download Russian train tickets online.